Most of us make New Years resolutions and every year promise ourselves we’ll actually stick with them, and maybe in the past you have. This year we are giving you some good reasons you should stick to your resolutions because 2013 is all about your home. 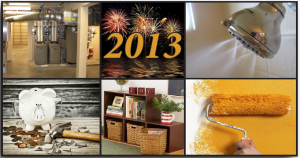 It’s a brand new year and it’s overflowing with possibilities to improve, de-clutter, and fix your house. Based on the most common New Years resolutions gathered by a few different sources including Time Magazine, USA.gov, Houselogic.com and others, we’ve come up with a list of promises to your home that will keep you both determined and inspired the whole year! Start by checking your HVAC ductwork, which are infamous for wasting energy due to leaking. Solve this problem by sealing and insulating your ductwork. According to Energy Star, it could improve the efficiency of your heating and cooling system by as much as 20%. In addition to being more comfortable in your home, you’ll also keep your furnace, air conditioner or heat pump in better shape, longer! Indoor air is full of dust, mold spores, pollen, and viruses and it only gets worse in the winter. To help eliminate these contaminants, maintain your HVAC system and change the filters on a regular basis. If you intend to remodel some rooms in your house this year, use low-VOC paints to keep the air pure, and burn real firewood in your fireplaces/wood stoves. This is better than pressed wood products because those could contain formaldehyde. With all these new ideas for home improvements, it’s hard not to plan big fancy renovations. Just remember they come with a price, so budget out the year to prevent over spending and prioritize these improvements… What’s necessary and what can wait then decide which of those are in your budget. The U.S. Census Bureau says an average of $3,300 per household is spent on annual maintenance and home improvements. This is a big one! Start going through things and sorting. Create more storage space and these day’s decorative baskets and other storage bins are appealing and affordable. So even if you have lots of stuff, organize so you can easily stash it and know where to find it when you need it. In addition, get creative with wasted spaces in your house. Turn that corner nook into something useful. The average household uses about 400 gallons of water each day! You could dramatically cut that down by replacing your shower heads with low-flow ones. These reduce the amount of flow but keeps the pressure!